I know I’ve been slow on the update to worldrider.com — but one thing is for sure, I haven’t been slow to keeping busy. So at the risk of filling the e-mailboxes of my followers and subscribers, please humor me by allowing me to catch up with a handful of posts and pics of my recent east coast tour and then some. While I grew up in New England and still cherish fond memories of fall colors, back roads and historic buildings and c harming old houses, it’s easy to remember the good of times past, and while caught up in the romance of revisiting old stomping grounds is also easy to forget many of those reasons I was drawn to the California Coast: cold, gray skies, rain and even snow. Don’t get me wrong. I love weather, the biting cold of chilling wind, sheeting rain and snowflakes on the tongue. But on a motorcycle? Sure, why not? 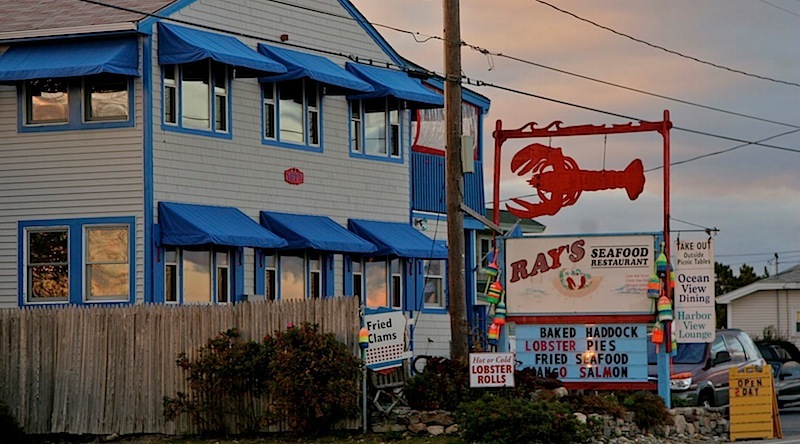 The idea of riding New England and the East Coast in October was incredibly alluring. The mere suggestion by Bob Henig of Bob’s BMW in Jessup, Maryland convinced me. The ride from a tiny no frills motel just a few miles from Max BMW in North Hampton at about 8am in the morning was a sudden slap in the face of just what 39 degrees feels like at 40 mph. And it’s not that I’m averse nor unprepared for changes in weather. Geeez, I think my bones are still thawing from my days in Patagonia in southern Argentina and Chile. I’ve got the layers, the Held winter gloves and liners and a heated vest. But I have I become soft by living in Southern California since returning from my trip just two years prior? Not a chance. I think the issue is simple: I just need to warm up to cold weather. I love seeing my breath first thing in the morning. And of the nearly 80 people that warmed the seats of Max’s showroom turned temporary multimedia theater at 10am that morning some 25 percent showed up on their bikes, including Nate Katz (aka PackMule), a fellow ADVrider who I’ve been in touch with since beginning my journey some five years ago. During the Q&A session of my presentation, Nate and others asked the usual and unusual questions that typically followed my prepared presentation. 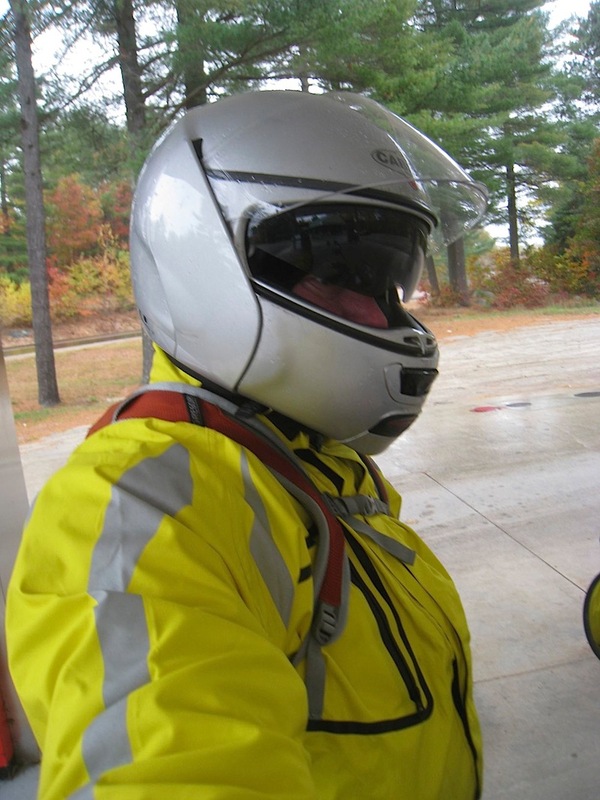 Nate rolled into North Hampton that morning on his new GS800 sporting the usual cadre of weather fighting and electric apparel. It’s no wonder before I got back on the road that Max Apparel Specialist Rose Marston convinced me to shell out dollars for a pair of heated Gerbing gloves. Me. Soft? Nah, everyone out here seems to wear them. Perhaps the best part of this tour, other than the opportunity to share my journey and stories from the road with new and old friends, is the number of coincidences and reconnections I’ve experienced. Not only did I finally meet Nate, I was surprised to learn that the brother of a very good friend, Ken Hauck, from my high school days lives in Exeter, a short hop from Portsmouth and North Hampton. 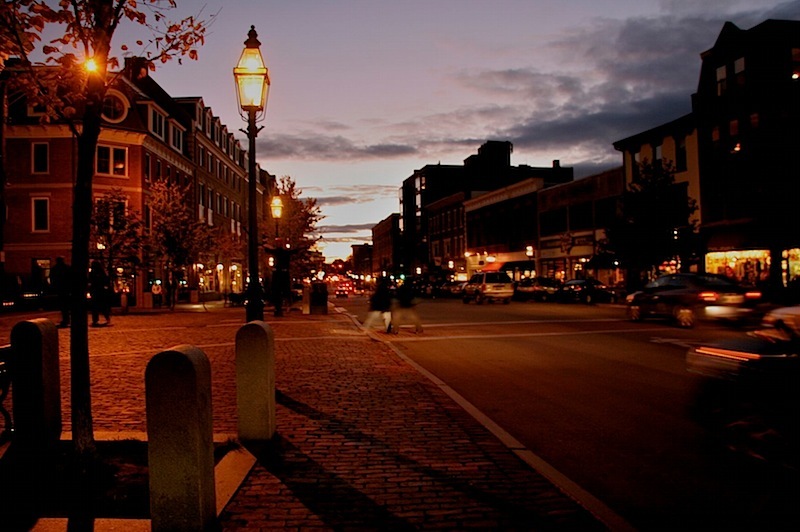 Peter greeted me at my motel and took me to dinner in the historic town of Portsmouth, which sits on the Atlantic coast and on the southern border of the Piscataqua River. Earlier that day I crossed that river over the classic truss lift Memorial Bridge to Badger island in Kittery Maine — marking the ninth state I’d visited so far on this journey. 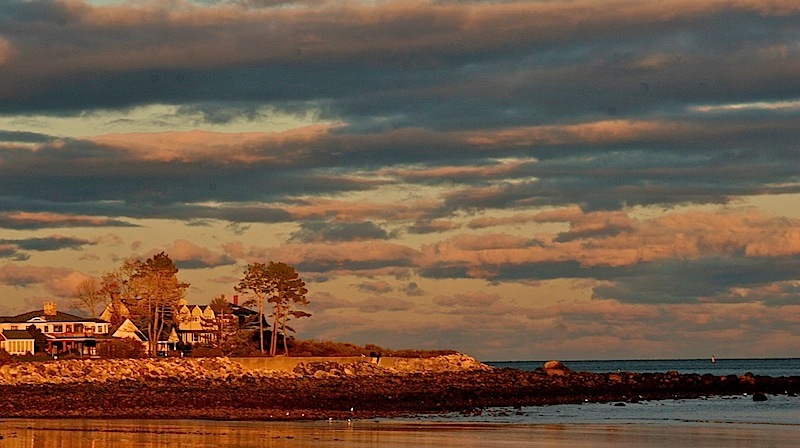 Along the Atlantic Coast just south of Portsmouth, New Hampshire. Perhaps even more amazing, after the presentation and Q&A a big guy sporting a mischievous smile sticks his hand out to greet me and says, “Allan Karl, it’s been a long time. I’m Brian, Kevin Skeith’s brother.” He squeezed my hand with a firm shake and we reminisced how some twenty-five years earlier when he was studying in college in the mid-west, he visited his brother Kevin, who at the time was my next door neighbor in Balboa, California. Even weirder, Brian certainly was the only person in the room who’d ever been on the back of a motorcycle with me at the helm. The details of why and where we were going are perhaps fogged by the years, but what will forever be ingrained in both of our memories and those of his brother and my friends who were following in a car close behind, is when the light turned green at the intersection of Newport Blvd and 17th, I pulled a wheelie for several seconds, until gently resting the front wheel of my Yamaha Turbo Seca motorcycle. Make no mistake, this was a completely unintentional wheelie. Throughout the week that Brian visited, remarking that he should be a linebacker on his native Chicago Bears team, I coined a nickname that would stick for the week: “Tiny.” With the mass of Tiny as he rode pillion, the force of the engine and his weight caused physics to take over and to both of our surprise, I’d done my first, and last, two-up wheelie on a motorcycle. 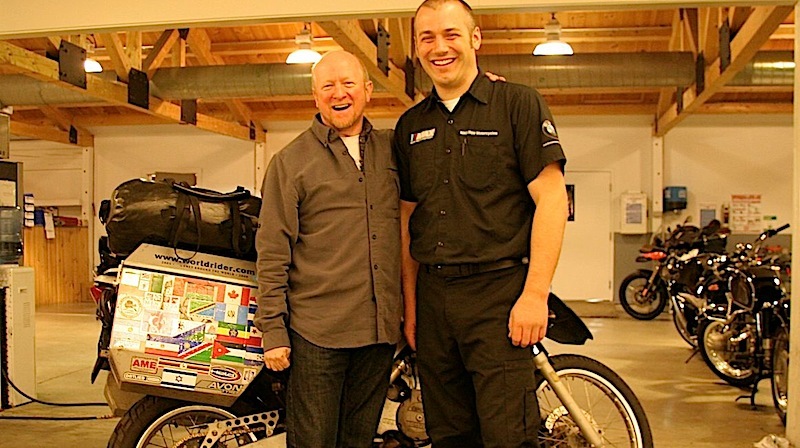 It was quite appropriate that we’d meet so many years later where I was able to share more stories of motorcycle adventures. 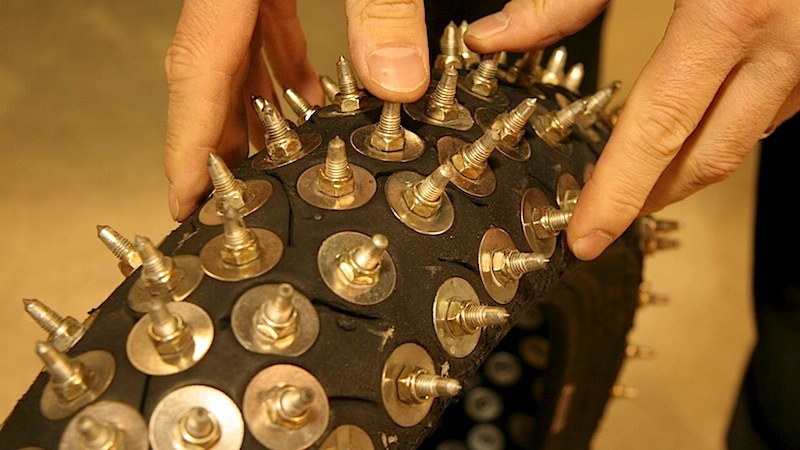 After the service department at Max’s were kind enough to check out of few minor issues I was experiencing, I hopped on the road and headed to Vermont, hoping to make it to Ludlow before the impending rains–or could it be snow? Owner Max Stratton runs two very successful BMW shops in New York and New Hampshire. 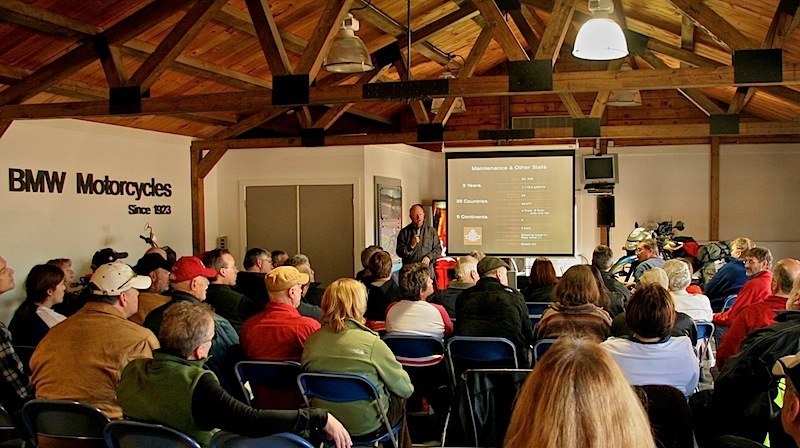 I was lucky to present and meet the staff and customers of both during my east coast presentation tour 2010. I hope to be back next year! A standing room only crowd filled the big showroom at Max’s in North Hampton, New Hampshire. 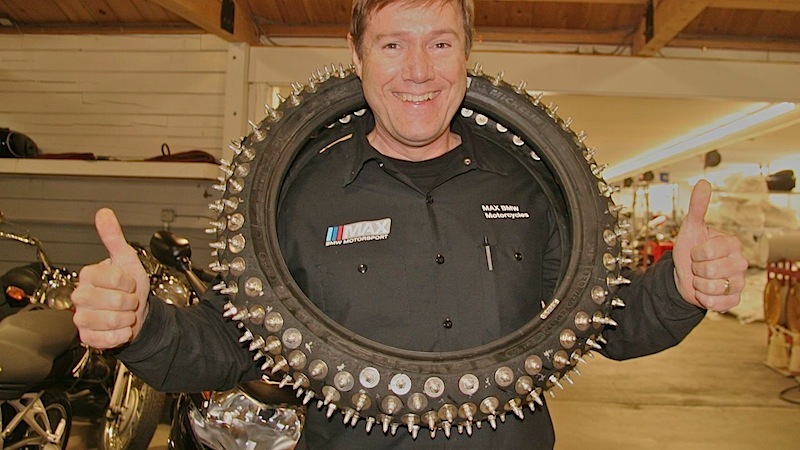 Max Service & Parts Specialist Joe Warner demonstrates the super ultra-studded ice tire used on the BMW S1000RR for racing and riding on ice lakes in New England. Max BMW doesn’t have just one female technician, but two! I was lucky to have one these smart and pretty ladies work on Doc. Here Zena Foster diagnoses an issue of a neutral light and side stand safety switch problem that’s been nagging me since Aswan, Egypt. 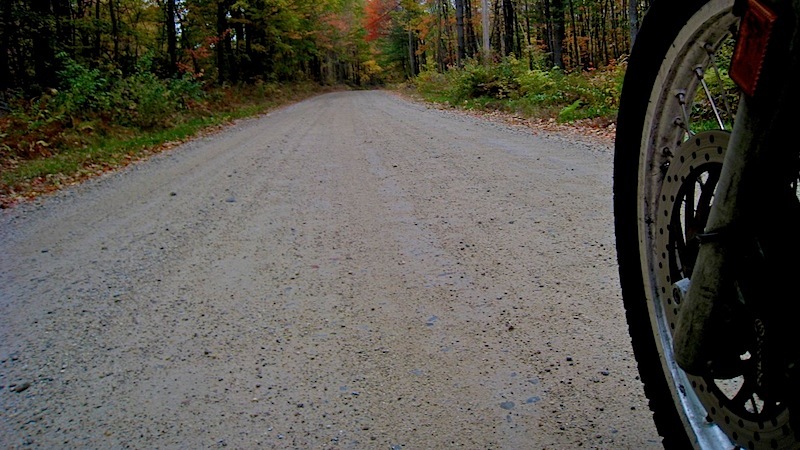 On the way to Vermont I was able to find some dirt roads just so Doc could experience some sort of adventure! The rain helped! 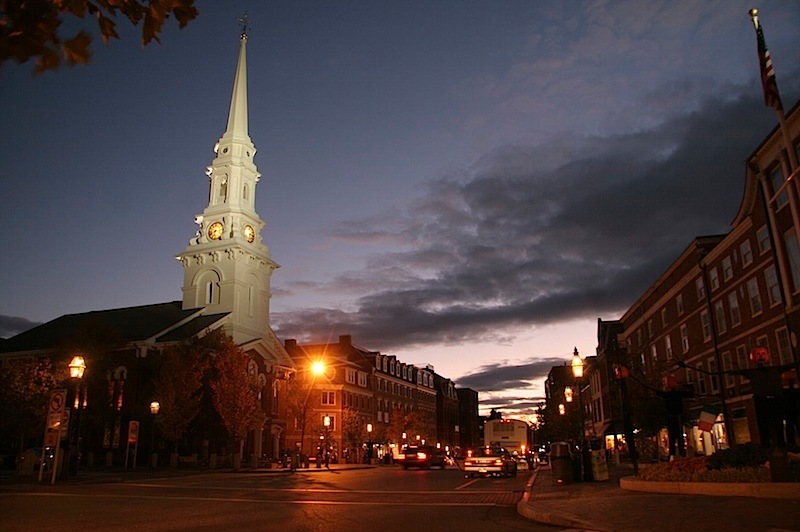 East Coast Presentation Tour - Come Join Me! Feeling Part of the Family With Friends Old & New in Rochester, New York.